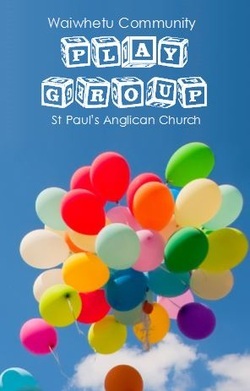 We would love for you to join us at Playgroup! All preschool children (aged 0-5) and their whanau are welcome. We start the session with free play time and usually begin music time around 10.15am followed by morning tea. We continue with free play until about 11.15am when we finish the session with everyone helping to tidy up. We ask that everyone makes a donation of $2 per family per session. In addition, if you can please bring one piece of fresh fruit and place it in the basket to share for morning tea.